2 weeks ago I had my second knee surgery in 4 months. This one was for my ACL. I am very appreciative that my husband, mom, kiddos, friends, and my staff have been so very very helpful. They have brought me ice packs and meals; become my taxi drivers; helped me get dressed (FYI, only family on the dressing assist). I do NOT like asking for help, and I do NOT like this feeling of dependence. Right now, I am dependent on the schedules, availability, and willingness of others. I am thankful for them, but it has made me mindful of the seniors we serve. Remember to truly see the heart of those we serve and those we work with. See the vibrancy, independence, and resourcefulness in others. See their strengths and skills instead of their frailty and impairments. This will be all of us one day, should we be so lucky to have those golden years. We are in the final 2 weeks to reserve ad space for the next edition of the guide. We pushed the deadline up a bit in order to provide the newest edition in time for a community event at the CHEC Center at Salem Hospital in September. 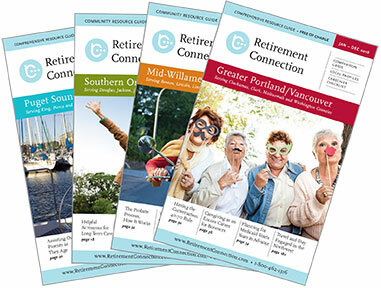 Thank you to all those that support Retirement Connection and allow us to provide the print guide, online event postings, networking opportunities, and release party. Without our sponsors, we would not have any of this. More than advertising, we work to provide collaborative and comprehensive resources.